Educators, we're pleased to once again offer our Teacher Discount Day at the Spring Sale on Sunday, April 28. All educators with a school ID get 50% off everything in our inventory, including all books and media. We’ll have a roster of current members at the sale door and memberships will be available for purchase/renewal at the sale. Join us for a festive Friends & Family Night at McMenamins Market Street Pub in downtown Portland. You can eat, drink, and support your local library all at the same time. 50% of the evening's proceeds will go to the Friends of the Multnomah County Library. While not required, reservations can be made for groups of 5 or more and the pub can accommodate parties of up to 20. Call (503) 497-0160 to book a table! This Giving Tuesday, Facebook will be matching donations made through their platform. We ask for your support in helping us reach more donors to get a larger matching donation from Facebook. 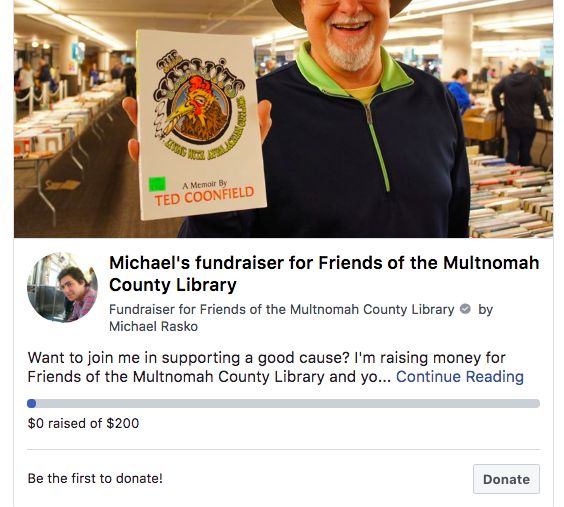 1) Go to this link: https://fb.com/fund/FriendMultCoLib/. This should start you down the process of creating a fundraiser for friends of the Multnomah County Library. 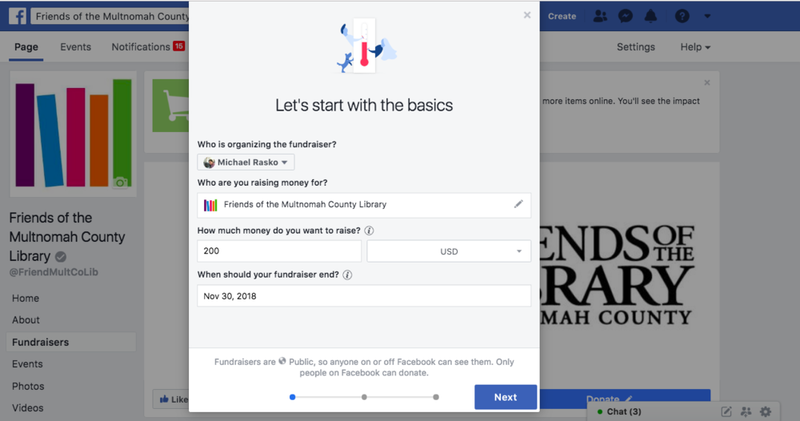 However, you can also select the fundraiser button on the left hand bar of your Facebook homepage and search for friends of Multnomah County Library. Please make sure it is Multnomah County as there are many Friends of the Library groups across the country. 2) Enter how much money you want to raise and your end date. 4) Revise the text for why you are raising money and make it personal to you. Remember to include that their donation will be matched to encourage greater participation. A draft description is included by default, but we encourage you to revise it to make it your own. 6) Choose a cover photo and drag to reposition. It defaults to our logo, but you can choose one of our recent photos or upload one of your own. I chose a photo of Ted Coonfield, who uncovered his own memoir when browsing a recent book sale of ours. 8) Click “Get Started” when Facebook encourages you to invite friends and share on your timeline. 9) Click on the “Invite” button next to the names of the friends you want to invite. 11) Write in any additional details you want to include in the section that Facebook prompts you with “I created this fundraiser because…” We encourage you to again mention that their donation will be matched by Facebook for those who don’t scroll all the way down to read the fundraiser details. 13) Click “Donate” on your own fundraiser in the timeline. 14) Select a donation amount you are comfortable with and fill in credit card information and an explanation for why you donated. 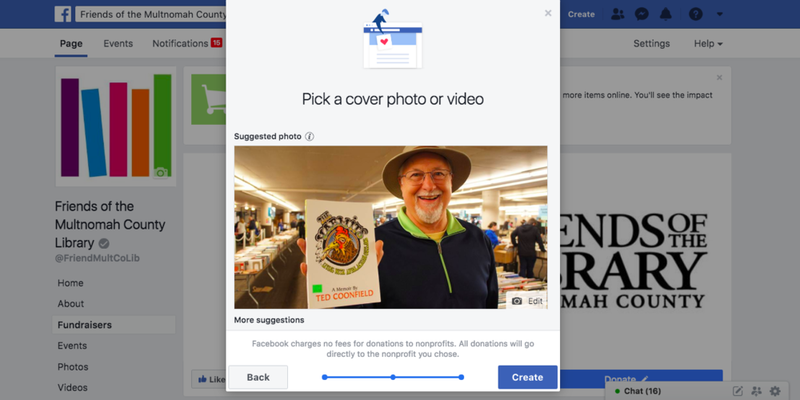 Keep the default of “public” when Facebook asks “Who can see that you donated?” We ask you to donate to your own fundraiser to get things started so that your fundraiser doesn’t show a big old goose egg in the amount raised section. This improves the social proof of the worthiness of the cause and is called “salting the tip jar.” However, unlike real tip jars, you are being very forthright as your name is publicly included as a donor on this fundraiser. 15) In addition to the post on your timeline, we encourage you to call, text, email, and speak with your friends face-to-face about this. Ask them to check your timeline and donate what they can to get Facebook to match their donation. This is necessary outreach to bring this to your network’s attention because there are so many posts on social media that your post may get pushed to the bottom of their feed, or they may quickly scroll past it. If you read the fine print from Facebook, you’ll see that the matching begins at 8am (5am Pacific Time) on Giving Tuesday and will last until the pot of matching funds is depleted. So we encourage you to ask your friends to donate early on Giving Tuesday. This promotion is a big opportunity for nonprofits like us. Last year, $45 million was raised on Giving Tuesday through Facebook’s platform. It’s the last day of our Fall Used Book Sale and everything is 50% off! Educators, we're pleased to once again offer our Teacher Discount Day at the Fall Sale on Sunday, October 28. All educators with a school ID get 50% off everything in our inventory, including all books and media. Join us for the Friends of the Library Annual Membership Meeting and the Friends Library Store's 21st birthday party, open to all current members. RSVP NOW. Helping us celebrate will be guest speaker, author Molly Gloss. A fourth-generation Oregonian, she is the bestselling author of The Jump-Off Creek, The Dazzle of Day, Wild Life, The Hearts of Horses and Falling From Horses. Her work has earned numerous awards, including an Oregon Book Award, a Pacific Northwest Booksellers Award, the PEN West Fiction Prize, the James Tiptree Jr. Award; and a Whiting Writers Award. We will also hear from Vailey Oehlke, Director of Libraries for Multnomah County. Exercise your voting privileges as members and say farewell to exiting board members while enjoying light refreshments. We will also be debuting a new custom item designed for the Friends Library Store. Come early to shop at the store, as all members will receive 20% off their purchases that day to celebrate! Educators, we're pleased to once again offer our Teacher Discount Day at the Spring Sale on Sunday, May 6. All educators with a school ID get 50% off everything in our inventory, including all books and media. Join Friends of the Library once again at the OHSU Farmers Market. We'll be selling a fantastic selection of used books and literary gifts. Need inspiration for your next meal? Pick up a cookbook! Or carry your veggies in style with one of our totes and support local farmers and your library at the same time. Trade a book for a beer! We will be at the Mississippi Street Fair again this year with a great selection of books and literary gifts. Stop by and say hi!